Non-PCB lighting ballasts ONLY. Max 69 pounds. If weight is exceeded, additional handling and transportation charges will be billed to the generator. LampMaster’s 5 Gal Lighting Ballast Recycling Kits hold up to 69 Pounds of Non-PCB Ballasts. An electrical ballast is a device intended to limit the amount of current in an electric circuit. A familiar and widely used example is the inductive ballast used in fluorescent lamps, however ballast can be found in a large array of lighting fixtures. The components found in lighting ballast can be broken down and should be always sent to a certified recycler, like LampMaster. 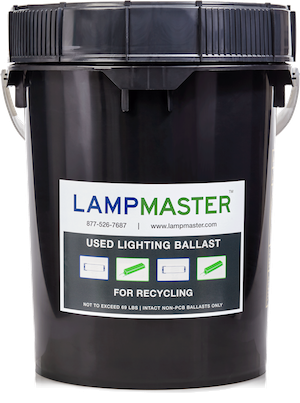 By recycling your ballast from old or obsolete fixtures with the LampMaster Lighting Ballast Recycling Kit 5gal, you’re enabling the raw materials to be collected and processed for reuse. Ordering the LampMaster Lighting Ballast Recycling Kit 5gal for collection when your office or facility is renovated is an easy and efficient way to collect spent lighting ballasts, plus you know your waste will always be disposed of properly. Our mail-back kits are only available for Non-PCB ballasts. However, if you have PCB Ballasts, we may be able to arrange a bulk pickup thru Cleanlites Recycling. We are always willing to work with you and find a solution for whatever waste stream you may have. Should you need to recycle fluorescent lamps along with your ballasts, we offer kits for all shapes and sizes of fluorescent lamps, including U-Bend and 4ft lamps.